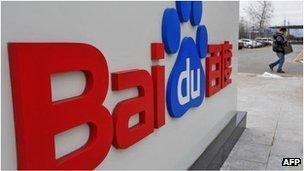 China's search giant Baidu is trying to fend off rival search engine Qihoo 360, launched less a fortnight ago. Qihoo told the BBC that the market leader had been using aggressive measures to preserve its user base. It said that when people used its new engine to search for a Baidu-related service, its rival re-directed them to its own search page. Qihoo said it had now decided to prioritise services other than Baidu's in its results. Baidu did not comment. One analyst said that it was unlikely Qihoo would threaten Baidu's lead in the short term, but the dispute was already frustrating web users. At the moment, Baidu has an 80% share of the Chinese search market. 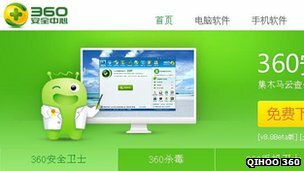 Qihoo, originally an anti-virus provider, launched its search tool on 16 August. The company's chief financial officer Alex Xu told the BBC that Qihoo had noticed Baidu interfering with search results a few days later. "Every time now users do a search about Baidu, instead of being taken to a particular Baidu website, they are re-directed to Baidu's search homepage. That's not how a web company is supposed to behave - you're affecting the users' experience," he said. "Let's say if you do a map search, and you get a link to a Baidu map in the search result - if you click on it, you don't get a map, you get Baidu's search page. "So we switched out of Baidu. Starting from today, our search results will emphasise alternative services, to help the user-experience." Qihoo's earlier solution was to re-direct users to the cached page of a specific Baidu website. Baidu has not faced any strong competitor since Google shut down its Chinese search site at Google.cn and started re-directing visitors to its servers in Hong Kong in 2010. Qihoo aims to change that, and as Mr Xu put it, "judging by Baidu's reaction, they certainly understand that we are out there, and they certainly treat us very seriously". But independent analyst Bill Bishop, based in China, told the BBC that it might be tricky for the newcomer to become a real rival. "It looks like Baidu and Qihoo are in a war, started by Qihoo," he said. "[But] Baidu is still far and away the dominant search provider in China, and it is unlikely that Qihoo would take significant share in the short-term. "As we saw with Qihoo-Tencent war, the consumers are an afterthought in the unrestrained competition between... companies." The dispute between Qihoo and Tencent, the firm behind a popular instant messaging platform QQ, happened in 2010. The feud was over alleged privacy infringements, with the two firms blocking each other's products. In November 2010, the Chinese Ministry of Industry and Information Technology stepped in, ordering the companies to end the argument and publicly apologise to their users.